I’m not trying to infiltrate a secret government facility, though it feels like it. I’ve arrived at Baird & Co’s precious-metal foundry to see how gold bars are made. At least, I hope I have. The place is shrouded in secrecy. There’s no signage on the building and once the security guard buzzes me in, I’m immediately asked to hand over my phone so it can be locked away. A man in red overalls appears and introduces himself as the refinery manager – let’s call him Jim. I would tell you his actual name but… well, I can’t. Security around the foundry is so tight that staff aren’t allowed to tell anyone what they do for a living. It’s like being a spy – if spies spent their days producing gold bars. ‘I tell people I work in scrap metal,’ says Jim. ‘Which is basically what it is.’ Not even the people in the building next door know what goes on in the factory, another worker tells me. ‘When they asked, I said we make cardboard boxes,’ he adds. When it came up in conversation with bar staff on a recent work night out, the Baird employees used a pie factory as their cover story. All sorts of machines mould, stamp and decorate the refined metal. One of the workers fires up a ring-making machine, which transforms what looks like a metal nut into a silver wedding band in ten seconds flat. It’s like magic. In another room, a guy is stamping tiny one-gram pieces of gold with the Baird & Co logo. They’re smaller than a postage stamp, but worth around £30 each. One-kilogram gold bars are slightly less affordable, clocking in at about £32,000 apiece; they’re smaller than I expected (not as big as an iPhone) but deceptively heavy. If a single gram of gold is worth £30, even the dust floating around must be worth a few quid. How do they stop particles on the workers’ clothes getting lost in the wash? ‘Nothing leaves the premises,’ says Jim. ‘We have our own launderette on site and all the uniforms are washed there. The water is processed so that the gold can be retrieved.’ That rule doesn’t apply to visitors, so while I might not have my own gold bar to take away, there’s a chance I’m leaving with a tiny smattering of precious dust on my jumper. I’m quids in! Gems are removed from old jewellery (above) before they’re melted down. Scrap metal arrives in all shapes and sizes: tableware, candle sticks and even gold teeth. Who knew that lustrous pure gold bars could come from such unglamorous origins? 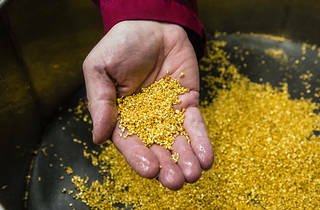 The gold is melted into a scrap bar, which is heated and placed in water during the refining process, shattering it into ‘golden cornflakes’ (above). Instead of milk, though, they add a mix of nitric and hydrochloric acids, known as ‘aqua regia’ (‘royal water’). It’s then purified with sulphur dioxide and becomes ‘gold sand’ (below), which is melted in a crucible (top right) at a whopping 1,100C. Just a few degrees higher than the Central line in a heatwave, then. The molten gold is then poured into water through a sieve, forming gold beads (above). A single bead is worth about £30. 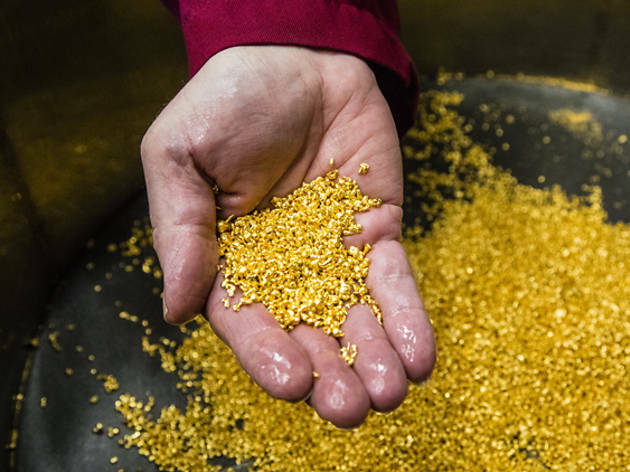 Once the gold has passed a test to determine its purity, it’s officially investment-grade and ready to be cast into 1kg (below) and 1g (below) bars. Most people store their gold bullion in high-security vaults – it’s not the kind of thing you keep in a shoebox under your bed, y’know?